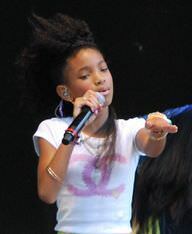 Willow Smith at the White House, Easter Egg Roll in April 2011. Willow Smith is an American singer and actress. She has released an EP. Songs: "Whip My Hair", "21st Century Girl", "Fireball". Films: "I Am Legend", "Madagascar: Escape 2 Africa" (voice). She has also created the duo Melodic Chaotic, along with producer DJ Fabrega. She has been nominated for an Annie Award for her voice acting and 4 BET Awards (1 win). She was born in Los Angeles in 2000. She is the daughter of rapper/actor Will Smith and actress Jada Pinkett Smith. Actor Jaden is her brother. Willow Smith is a famous American actress and singer, who was born on October 31, 2000. As a person born on this date, Willow Smith is listed in our database as the 2nd most popular celebrity for the day (October 31) and the 1st most popular for the year (2000). People born on October 31 fall under the Zodiac sign of Scorpio, the Scorpion. Willow Smith is the 94th most popular Scorpio. Aside from information specific to Willow Smith's birthday, Willow Smith is the 675th most famous American and ranks 479th in famous people born in Los Angeles, California, U.S. In general, Willow Smith ranks as the 1148th most popular famous person, and the 230th most popular actress of all time. “The Famous Birthdays” catalogs over 25,000 famous people, everyone from actors to singers to scientists to serial killers and more. If you're curious to see who was born on your birthday, you can use our database to find out who, what, where, when and why. You can search by birthday, birthplace, claim to fame or any other information by typing in the search box, or simply browse our site by selecting the month, the day, the horoscope, or any other clickable option. 479th born in Los Angeles, California, U.S.